Last week, I mentioned my daughter’s bat mitzvah, and the beautiful invitations that we sent out. As part of the celebrations, we also wanted to jazz things up a bit, and so my wife decided to speak to somebody about décor options. We didn’t want to have an overly fancy, lavish setup, nor were we interested in going crazy with our budget. We did want to have a nice centerpiece on each table, some décor for the buffet area, a guest book so our daughter would have a souvenir to remember things by, and we also needed to have something for the table cards. While some people go crazy depending on what type of celebration you’re having, we wanted to keep things somewhat low key but still elegant, whimsical and special. Enter Lori from Behind the Scenes Creations. My wife had been referred to a few people, but as soon as she spoke to Lori, she knew she had found someone she could work with….something just clicked. Lori was creative, energetic, warm and understood our need to stay within our budget. For the centerpieces, one of the themes throughout the function was the pineapple because it’s my daughter’s favourite fruit (and the symbol for hospitality). As a result, Lori put a pineapple on each table, on an attractive wooden platform, alongside a terrarium with cacti and succulents (another one of my daughter’s favourite things). 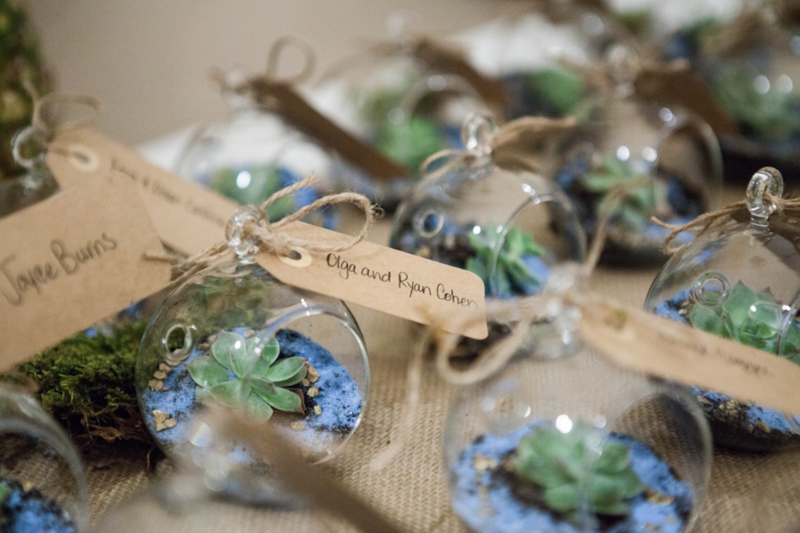 For the table cards, Lori handmade mini glass terrariums that mimicked the centerpieces, that were filled with live succulents. Lori built stand up letters for the buffet, using flowers, for my daughter’s name. Lastly, Lori suggested we put together a nice photo album (we did this at Costco) that everyone could sign. With the exception of the photo album, Lori put together all of these items on her own. Recognizing the manual labour that went into these pieces, I’m still amazed she was able to do this….and at an extremely reasonable price. The telltale sign of success were the compliments we received. Whether it was the comments regarding the centrepieces, the numerous people who asked to take a centerpiece (and the pineapples!) home and the many, many, MANY compliments on the table cards, Lori obviously is doing something right. If you’re in need of a superb event and decorations planner, someone that you will love working with, I implore you to consider Lori. She did a fantastic job of bringing our vision to life for us.